I have only recently come across this extraordinary and utterly brilliant invention. Sugru is a highly versatile mouldable glue that can be used to stick and fix just about anything. You can use it for DIY jobs around the house. You can use it to mend broken pieces of furniture and toys. Or you can get creative with it. The possibilities are endless. 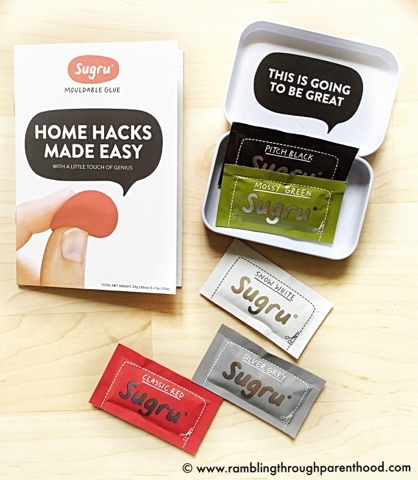 I am loving this Sugru Starter Pack that came with a handy guide, a pack of five brightly coloured Sugru sachets and a little tin to hold any open ones. The guide is full of ideas and inspiration to help you make the most of Sugru. I have used Sugru to mend a leaky drainage pipe and to fix the computer cable. It has been amazing. All I had to do is cut open a packet, roll the Sugru into a ball in the palm of my hand and mould it to the shape I wanted. I let it set for 24 hours, and voila! Job done. I am looking forward to doing a lot more with it in the coming days and weeks. Watch this space. Tulips are one of my favourite flowers and I had always wanted to visit The Netherland in springtime to admire the bulb fields. We did manage a visit this year, when we visited the little working village of Zaanse Schans near Amsterdam. Is where I picked up this bunch of delightful, brightly coloured wooden tulips. They now sit on my kitchen window and brighten up even the dreariest of dull days. I am loving this pretty and sparkly t-shirt from elesclothing.co.uk. It is 85% polyester and 15% linen, but it feels very cotton-like to the touch. With short sleeves and a round neck, I think it is perfect for the summer. The sequin detail and the grey colour give it a shimmering quality that can add to the glam quotient when teamed up with a pair of black skinny jeans. I was on the lookout for something like these for a while now, and am glad to have spotted them in Claire's. They are drop earrings with fish hook backs and a pretty crystal detail. 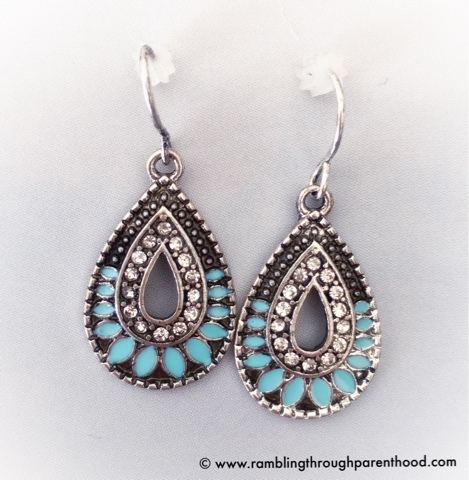 The turquoise on silver-tone metal gives it that Bohemian/ ethnic Indian look that I was after. So what do you make of my Spring picks? Do you have a favourite? Disclosure: This post contains review sample pieces. All opinions are my own. I love the look of the wooden tulips such a lovely way to brighten up a room and a bit different too. I agree, Joanna. I do love them and yes, they have brightened up my kitchen. Oh, no! What happened, Kara? It's worked really well for us so far. I love the wooden tulips! I hate cut flowers as I find them a bit creepy, "Here honey, I killed these as a token of affection..." but I love the bright cheerfulness of flowers in general. These sound like a great compromise! I do love flowers in general, but consider it wasteful to spend money on cut flowers. These certainly are a perfect compromise. Got some pieces from Eles Clothing. I love all you have here. Thanks, Stella. I just wish it wasn't all about bulk buys and that you could buy individual items. Isn't it gorgeous! I love how comfy it is as well. Perfect for a night out in summer. I was spoilt for choice, there were so many colours available. So decided to pick one each for starters. It's not a brand, hun. They do wholesale clothes, ex-retail and at a great price. Only trouble is, it is bulk buy. I think I could do with the wooden tulips as the real ones never last for very long. It certainly is fascinating. Give it a try, Grant, and let me know how you get on. 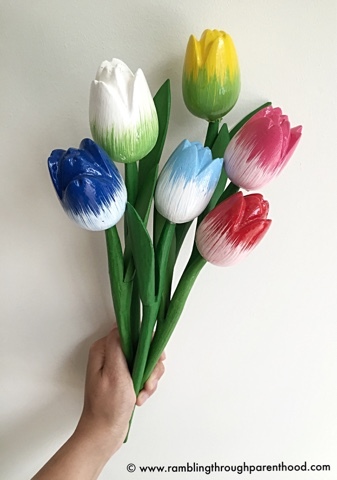 The wooden tulips are beautiful! 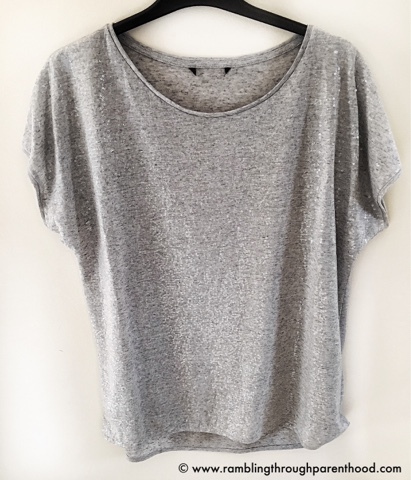 I love the grey sequin shirt too its looks very comfy! It so is, Ana! Love how the material feels against my skin.